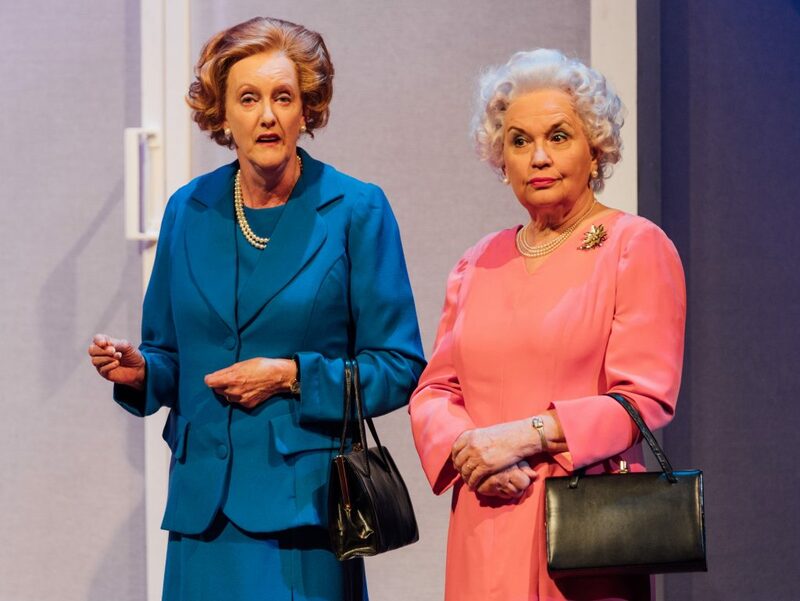 Two formidable figures – the Queen and Margaret Thatcher – are reunited in Moira Buffini’s funny, sharp and mischievous comedy, Handbagged which is at York Theatre Royal later this month starring Susan Pengaligon, Caroline Harker, Eve Matheson and Sarah Crowden. 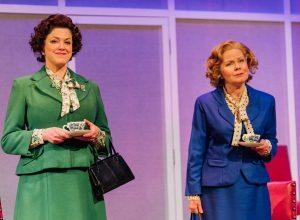 The co-production, with Wiltshire Creative and Oldham Coliseum, imagines what might have happened at the Queen’s weekly meetings with Margaret Thatcher when the latter was Prime Minister. Penhaligon and Harker share the spoils as HRH while Matheson and Crowden grapple with the formidable Mrs T.
Completing the cast are Jahvel Hall and Andy Secombe who, between them play a range of familiar characters including Ronald and Nancy Reagan, Gerry Adams, Arthur Scargill and the Duke of Edinburgh. 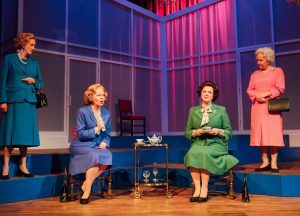 The foursome took time out from their schedule at Salisbury Playhouse, where the production is playing until Saturday, to talk to Stage Review about the show. Susan Penhaligon who plays Q, an older version of the Queen, said she was attracted to the project beause she had never done a political satire before. “I’m very interested in politics and the play made me laugh – and who’s going to turn down the opportunity to play the Queen? “It’s wonderful to play a real person. You’ve got a blueprint. “You have to watch documentaries and look at pictures, but it’s a physical blueprint. The challenge is to make them real and not a Spitting Image caricature. “I have never met the Queen or Margaret Thatcher but I met the Queen Mother once at a film premiere. I stood next to Ronnie Barker. Caroline Harker plays Liz, a younger version of The Queen. She said: “It’s something I meant to see in London but I was working when it was on. “I have three friends who’ve been in other productions of Handbagged so it was in my head when it came up. “It comes off the page so easily, but it is a challenge. I’m trying to work out how much to stick to being The Queen and how much to go with the drama. “I never met Margaret Thatcher but I have been in the same space as The Queen. “I’ve been to two garden parties at Buckingham Palace because my mother is on a charity board. The food was lovely. I remember iced coffee and tiny sandwiches. “I remember the Silver Jubilee when I was at school and that day we were allowed to walk to the end of the drive and wave flags as the Queen drove by. Sarah Crowden was thrilled at the prospect of playing the older Margaret Thatcher. “To play Margaret Thatcher! It’s very interesting because she’s far more nuanced than the Spitting Image caricature of her. “Someone who was so contentious is a little alarming. 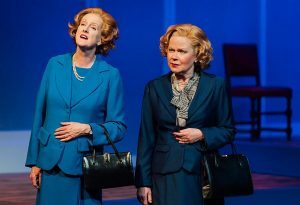 Eve Matheson, who plays a younger version of Margaret Thatcher, said: “I never dreamt in a million years that I would ever be asked to play Margaret Thatcher. “But I tried and it seemed to work so I thought why not? 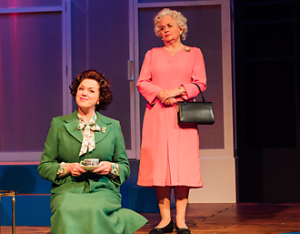 “Handbagged has four wonderful roles for middle-aged women. And you can cross out middle-aged. We’re experienced. “That’s not always the way with roles so when one comes along you leap at it. And with the men, they’re playing eight, nine or 10 characters each”. She agreed that playing a real person presented its challenges. “I’ve never done it before. It’s a responsibility, obviously, but we’re all thinking along the same lines. We’re not impressionists – although I find them hugely entertaining, it’s a different area.